Still reveling in yet another cool July morning, temperatures in the high 50’s and low humidity, what a treat! We did get a bit of rain on Monday, and I raced around to finish the summer cover crop planting. A week and a half ago (July 4th weekend) in anticipation of the best chance of rain in weeks I rushed around and seeded an acre of summer covers, as a light rain was falling. It turned out to be all the rain we would get that day, Arghh!! Just enough water to get some of them to come up but not all. Mondays half an inch of rain was hopefully enough to bring the rest up, looks like another chance of rain tomorrow too. With the drought, the varmits are moving in to take advantage of the juicy plants and fruit. The squirrels are really out of control in the tomatoes and in some of the transplants for late summer production. Something, squirrels we think, got up onto the benches where we had lettuce and Brussels sprouts transplants in the seed flats and ate the tops off of all the Brussels sprout plants and much of the lettuce too. So the hunt continues with daily afternoon rounds, so far the tally is four groundhogs and five squirrels. Everybody is beginning to ask when we will have peppers and begin roasting at market. Well the easy answer is the roasting will begin, as usual, the end of August when we have an abundance of colored bell peppers. The answer to when we will have a good supply of peppers at market is harder. 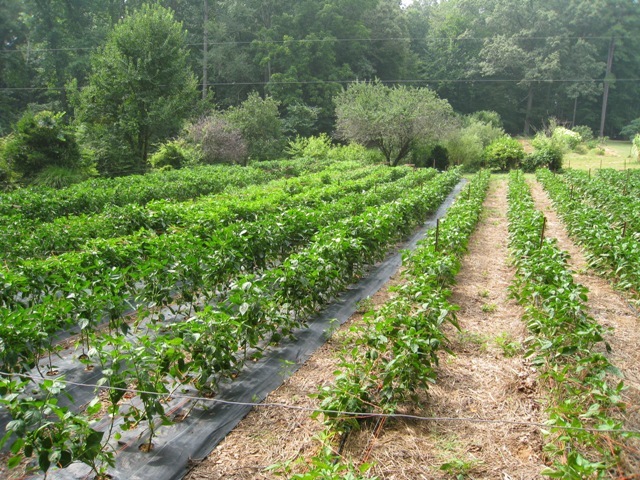 We have been working in the pepper field this week and the plants look amazing, maybe a good as any crop we have ever grown, but for some reason almost all of the early blossoms made no fruit. Some times it is a result of high temperatures and resulting bad pollination but we have just not been that hot, my best guess is the heavy pounding rains a month ago actually knocked the blooms off the plants. That being the case it will be late this month before we have many green bells and the same for anaheims and poblanos. The good news is that with such vigorous plants we should have more, better quality, fruit later in the summer than usual. There are a number of Peregrine Farm related dinners coming up in the next month that you might be interested in. The first is next Tuesday, the 21st, at 18 Seaboard in Raleigh. A tomato focused event, Jason is coming up with dishes around each of the varieties we grow. The second is our annual Panzanella farm dinner on the 27th, it looks to be equally divided between tomato dishes and pepper dishes, it is always fun. The last two are cooking classes at A Southern Season the first is a lunch class on the 28th with Marilyn Markel who runs the cooking school and the second is an evening class on August 6th with Ricky Moore of Glass Half Full, again focused on tomatoes.